Photo by Seth Snyder | Thanks Seth! Three weeks ago, we opened our doors to the general public, and things have been picking up speed. There is a good deal of work being done in the wiki, and all kinds changes are being made out as we speak. As you probably know, there have been a few promotions going on around here, and at the end of this post you will find our biggest promotion yet. 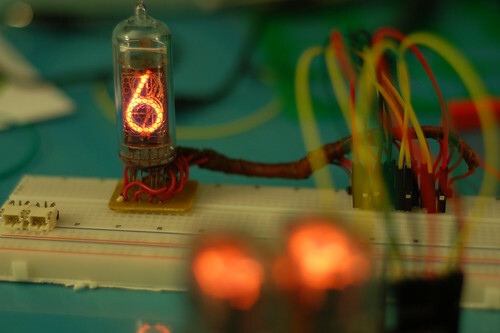 For those who do not know, the nixie tube (pictured above) was a precursor to the 7-segment LED display. But instead of simplifying things and making all numbers come from a series of seven lines, its creators wanted real typography, and not the stuff you could get with 2.5 volts, the kind that only a 170 volt neon tube could bring you. 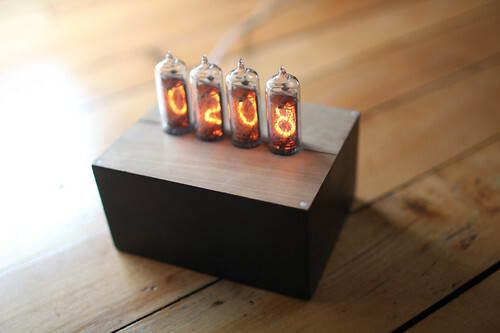 This is the nixie tube, a 170 volt neon tube where each number has its own cathode, which are all stacked on top of each other. So, 11 connections. You connect two, and the number 3 lights up, another two, and it lights up the number 9. The orange glow is enough to drive a man mad from obsessing over it – but what to do with it? I wanted something that would be for bildr and, if possible, connect to the internet – doesn’t everything need to? So, I decided to do what any self-obsorbed site-creator would do: I was going to make a nixie display that showed the amount of twitter followers bildr had, and then recheck every 30 seconds. 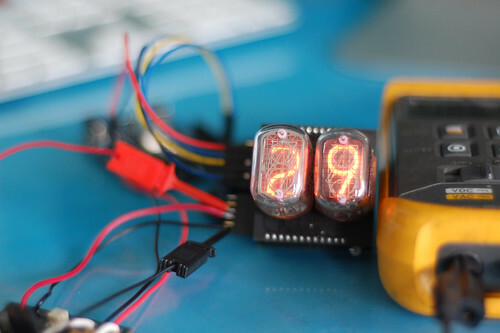 I started by looking at existing projects and looking for kits that may be available for controlling the nixie tubes from an Arduino (my platform of choice). The problems you encounter when going to work with these tubes is that 1: they operate at 170 volts; 2: with 10 control pins per tube, you quickly run out of open pins on your Arduino; 3: they’re not exactly serial. BUT… I found a fix! 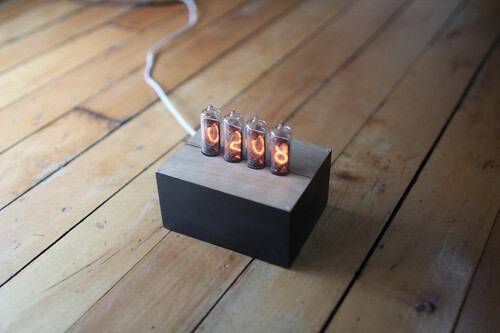 A company out of Canada called Ogi Lumen sells open-source parts for controlling nixie and neon tubes that solve all of these issues. They offer a 170v power supply (takes 7-12v in), and they have chainable boards that just plug in next to each other and connect to the Arduino, so if you want 2 or 12 digits, you are set. They even made an Arduino Library that allows you to just give it a number, and it will make it all happen for you. So I ordered a kit that would accommodate 4 tubes. Because I’m a designer, sadly, I obsess over things I probably shouldn’t. 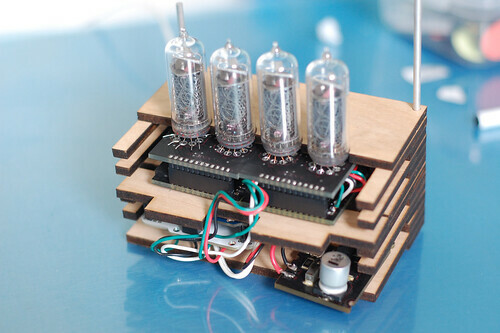 In this case, it was the fact that the nixie tubes used in the Ogi kit are not how I envisioned this project looking. For that, I ordered this crazy kit from Ukraine that was from a war sub, or something, back when they were part of the Soviet Union. I kid you not, when I tell you this – the tubes in this kit were connected to wire that I’m pretty sure was wrapped in some sort of animal skin. Yes… you can buy the tubes separately, but I thought I would save time and money by buying them already mounted. DON’T DO THIS! It’s really not worth dealing with 30-year old animal parts to save a few bucks. Oh… so this is where my need for a different look came back to bite me. 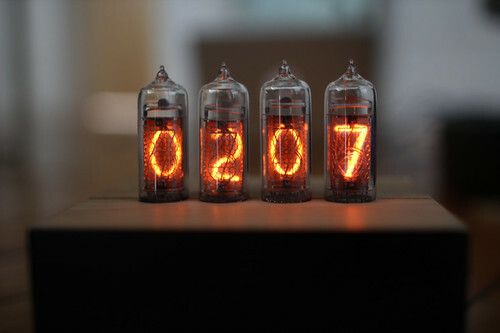 The pins on the nixie tubes in the Ogi kit run counter-clockwise, 1-0. But the pins on the crazy animal-ridden tubes… they run clockwise. So 0 is 1, 9 is 2, 8 is 3, and so on. If that was not bad enough… because the Ogi kit tubes look up, when I attached my tubes to it, they were backwards, facing the back. All I need to do is turn it around, right? Well, yeah, this is what I did, but now digit 1 is digit 4, and 2 is 3, and so on, so our 160 followers (at the time) became 061. Basically, I had to re-do part of the library and re-order the write-out, all because I needed a different look. But it is so beautiful, right? To control the tubes and connect to the internet, other than the awesome Ogi Lumen kit, I used Sparkfun’s Arduino pro and Seeed Studio’s ethernet shield. 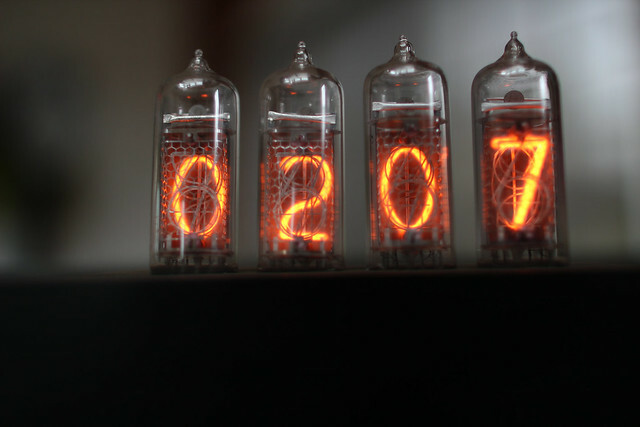 Then, I just tied into twitter’s API to grab all of bildr’s followers, and told the nixie tubes to display that number and repeat every 30 seconds. Funny, but the code and electronics was, by far, the easiest part (other than having wires keep breaking on me while prototyping) – the Ogi boards are very thick and make solder reworking harder. Then, there is the case…. First, let me say this: I went to a school that has the most beautiful wood and metal shops you could imagine. I know how to properly hollow grind a chisel, I have built a 5in bearing out of aluminum using a metal lathe and bridgeport. But, after graduating, I had no more shop access, and it’s really sad. Thankfully, the people over at Ponoko are helping to ease that pain. If you don’t know Ponoko, you need to. 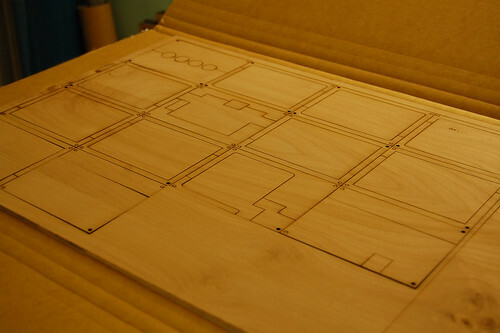 They offer laser cutting service that is top notch, offering tons of different materials, and all with great prices, and they provide excellent service. So, I opened Adobe Illustrator and started designing a box that would wrap around the electronics and sandwich everything together in a way that I could pull it apart when I wanted to change something. I designed a box one layer at a time and placed 1/8in holes in the corners of every piece to place alignment pins in so it would all just come together. About two weeks later, when I got the campfire-smelling package, I was floored. Everything came out so beautiful and clean. All of the pieces fit so well, and the ethernet jack must have had less than 2/1000th of an inch tolerance. It all just fit so perfectly. But, after gluing the two halves together, I decided to take my box plane and smooth the sides a bit. Again, lacking a shop, the glue-up wasn’t 100% perfect with the lame clamps I had. But, doing this removed half of the burned edges and, again, being obsessed I decided to just go for it. I glued the two halves together (I guess fixing it is out of the question), and planed and sanded all four sides. Then, over the next three days, I did a process of wood fill (the sides of the material were almost sponge-like, not sure what it is), sand, paint, sand, fill, paint, and so on about six times until I had perfectly smooth, sharp-edged, perfectly black sides. It took a lot of time to make it look great, but in the end I have the coolest looking twitter counter I have ever seen. It is really beautiful in person. AND!!! You can interact with it by joining our twitter feed ( @bildr ). It checks the stats every 30 seconds, so let’s see how high we can get it. So, now it’s your turn!!!! 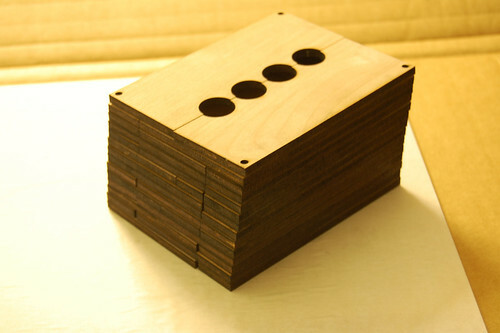 This is what I did with four nixie digits and Ponoko laser cutting. What would you do? I want to hear it, and you may get to make it. I will also help out with any other parts you need to make it happen (within reason)! So, what are you going to make? Is it a random number generator using a geiger counter? Will it be a countdown to the next Star Wars convention? Is it your longitude on display at all times? Maybe it is a bluetooth display to show the last four digits of an incoming call. It could be anything. If you have an idea, send us an email at [email protected], and let us know what it is. Also, let us know that you know how to make it happen and are comfortable working with a high power system. 170v isn’t a joke, and we want this to go to someone who will actually be able to put it together. Also, note that Ponoko is not available in all areas, and shipping is really expensive to some places, so location may play a small part in our decision. We will be accepting entries until november 22nd, so get cracking! A few months ago we offered to fund user projects in return for good documentation. The idea was that we could promote a bildr user by showcasing their work and paying for the parts to construct it. In return we would get more information for our wiki, more code for the community, and great content for our blog. So we sent the message out, and Paul over at digitalmisery came back with a rather strange idea… for Halloween, he needed a Jacob’s ladder that would be kid friendly. Paul came up with the ingenious idea of replacing the multi-thousand volt arcs found on the ladder with strips of EL wire. If you have ever seen a Jacob’s ladder in person, then you know that one of the best things about it is the wonderful “ZAAAaaaappppp” sound that comes from the arcing electricity. Paul wouldn’t have his any other way, but because the EL wire was silent, his would play a recording synchronized to the wire. We at bildr couldn’t pass up such a cool project, so I asked Paul for a list of parts, sent him some funds, and let him get to work. At the time, I don’t think I could have known how cool this was going to come out. After all, anything worth doing is worth doing well, right? And how do you do something well? You make a custom lego case for it that enhances the entire project. And using Adafruit’s Wave Shield, SparkFun’s EL Sequencer, and an arduino, Paul was able to nail the look and sound of the real deal. Paul did an excellent job detailing the entire process and has source code available on his site for download, so go check it out. Thank you Paul for being our guinea pig, and for letting us be a part of this. If you have a crazy-cool or just crazy project you would like to have bildr fund, send your proposal to [email protected] . Sadly, because bildr is not a company (we would be a sweet one if we were, though), we can’t fund them all. You can read more about the promotion here. Paul is an Electrical Engineer (Illinois ECE ’01) and his website, DigitalMisery.com, showcases DIY projects he and his family have created together. When he’s not working designing or testing electronic systems for aerospace and military applications, he loves to tinker at home with PCB design, programmable circuitry, and the occasional box of LEGO bricks. It has been just a couple of weeks since we opened, and, while things could be growing faster, we are doing well. The first week we gave away $100 to sparkfun via twitter, the second week we gave away 5x development boards from ProtoStack to users who would help build documentation around them. So now, in the third week, we need something else, right? Well, we do have something else. Ever find yourself in a situation where you need to know what the output of your microcontroller is? Or maybe you just wish you could see what your sensor is doing? Well, for this, you need an oscilloscope. Most of these are pretty bulky, and if you are like me, you don’t have much desk space. So, for people like me, I announce this week’s something else. This week’s something else is actually 2 of something. Seeed Studio has sent us 2 of their awesome DSO nano – Pocket size digital storage oscilloscopes to give away. I have to say, these things are so much thinner than I thought they would be, and they are just insanely cool at that. But how do we give these away?… they are too cool for just a normal giveaway. Or, if we do a normal giveaway for one, we need to do something crazy for the other. Should we just give them away at random, or reward a great article in our wiki? Do we send one to someone to write a review? Reward the coolest project? You tell us. So now it is up to you to let us know how we should determine how to give these away. Tell us what you would do for a DSO Nano (or how we should give them away) via twitter ( @bildr ) or email ( [email protected] ), and you may end up with one of these on your doorstep. If the portable oscilloscope is not your thing, stay tuned for more promotions from Ponoko, and ogi lumen.